8 years of TGirl Nights! We celebrate our 8th year of TGirl Tuesdays March 14th! Tuesdays have always been fantastic and we continue our weeknight events for everyone to enjoy. Come Party with Us! Hamburger Marys 8th Annual MARDI GRAS PARTY! 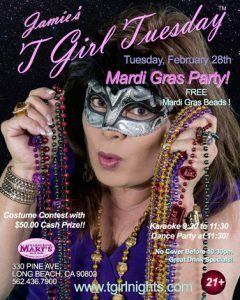 Tuesday 2/28 at TGirl Tuesday! FREE BEADS! FIFTY DOLLARS CASH for Best Costume! Karaoke from 9:00,Dance Party at 11:00! One of the years best Tuesday Parties! LET THE GOOD TIMES ROLL! The Grooby Girls appearing this Saturday are Tori Mayes, Sofia Ferrera, Isabella Sorrenti and Nadia Love! Come Meet the Girls Saturday Night at Jamies TGirl Saturday! 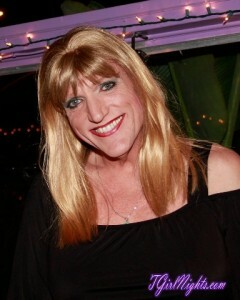 Hamburger Marys, Long Beach is a great venue! Our Saturday Parties are incredible and the club is beautiful! 1st Saturday of every month is TGirl Saturday! Jamies TGirl Saturdays feature Southern California’s Hottest TGirl GoGo Dancers! Join Us Saturday Feb 4th for the Biggest and Best Monthly Trans Club Party, at Hamburger Mary’s Long Beach. The year 2015 is just flying by! I am looking over Halloween Costume choices, what’s next? Christmas Shopping?? 🙂 We have our October 3rd Saturday Party on the way plus our HUGE TGirl Tuesday Annual Halloween Costume Party October 27th. We have lots of great events ready for you!